One of the world’s most renowned and decorated journalists announced Nov. 10 that he has donated his papers to University of Iowa Libraries. Tom Brokaw, who attended the UI during his freshman year in 1958–59, made the announcement live on NBC’s Today show. “It was their idea,” Brokaw said, referring to the UI Libraries. “They came to me, and I was kind of reluctant. Do I have enough important stuff? And then they were persistent. They’ve got a wonderful, world-class library. They’re all digitalized, connected to the Library of Congress. The collection, The Papers of Tom Brokaw: A Life and Career, includes papers and artifacts spanning his 50 years with NBC, which he says were filled with “seismic events.” Those events included the collapse of the Soviet Union, the rebirth of China as a world power, the turbulent years of the United States in the second half of the 20th century, and the rise of the digital age. “All of those events will be represented with interviews, reflections, and memorabilia,” Brokaw says. Brokaw is a television journalist who quickly rose to prominence at NBC, covering politics and world events early in his career from Los Angeles and the White House during the Watergate political scandal. He became co-anchor of the Today show in 1976. He anchored NBC Nightly News as managing editor from 1982 to 2004, after which he became a special correspondent for NBC News. He also is the author of several books. Brokaw, who graduated from the University of South Dakota in 1964, chose the UI as the home for his collection because of its unmatched library facilities. After UI initiated what Brokaw calls a “detailed and ambitious idea of accepting, organizing, and displaying my papers and other artifacts,” he says he flew to Iowa City to learn more. “One visit to the state-of-the-art library managed by world-class librarians persuaded me that it would be an honor to have my life’s work represented there,” he says. 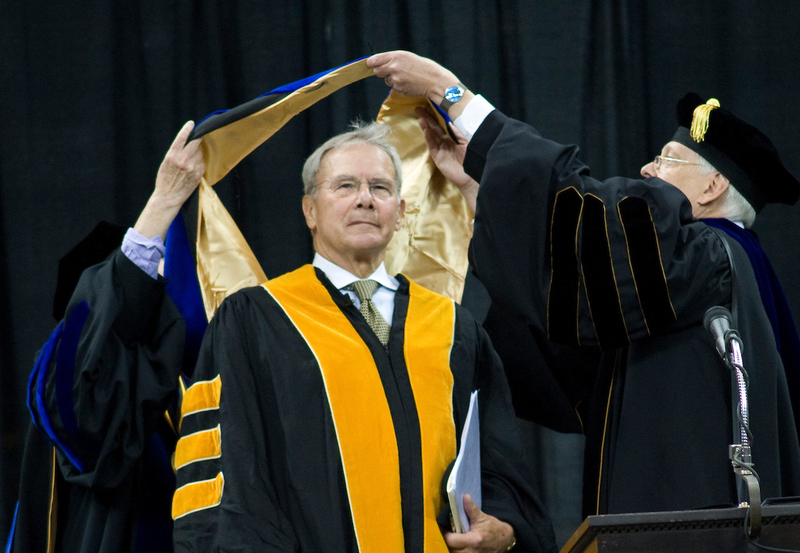 Tom Brokaw, seen here receiving an honorary degree at a UI commencement ceremony in 2010, has long been a donor and friend of the university In addition to his honorary degree, Brokaw received the Distinguished Alumni Award in 1996. File photo by Tim Schoon. “For example, Mikhail Gorbachev and Nelson Mandela are the fathers of momentous change in their countries. Students will hear their early hopes and dreams for the new age and measure that against later reality,” he says. Greg Prickman, head of Special Collections at UI Libraries, said making Brokaw’s papers accessible to UI students and researchers is an honor. The collection will be available in the spring of 2017. “The range of historic events represented in the papers is extraordinary, and users of the collection will be able to study these events through the experiences of one of our most thoughtful and respected journalists,” Prickman says. Brokaw’s confidence in UI Libraries reflects the critical role that research libraries play in acquiring, making available, and preserving distinctive collections, says University Librarian John Culshaw. “The primary source material contained in Mr. Brokaw’s papers will be invaluable to researchers and serve to enhance the learning experience for UI students in several disciplines,” he says. Brokaw has long been a donor and friend of the UI. He received the Distinguished Alumni Award in 1996 and an honorary degree in 2010. Brokaw will be in Iowa City during the weekend of Nov. 12–13 for a speaking engagement with the Hoover Presidential Foundation and plans to take in some of his favorite spots on campus. 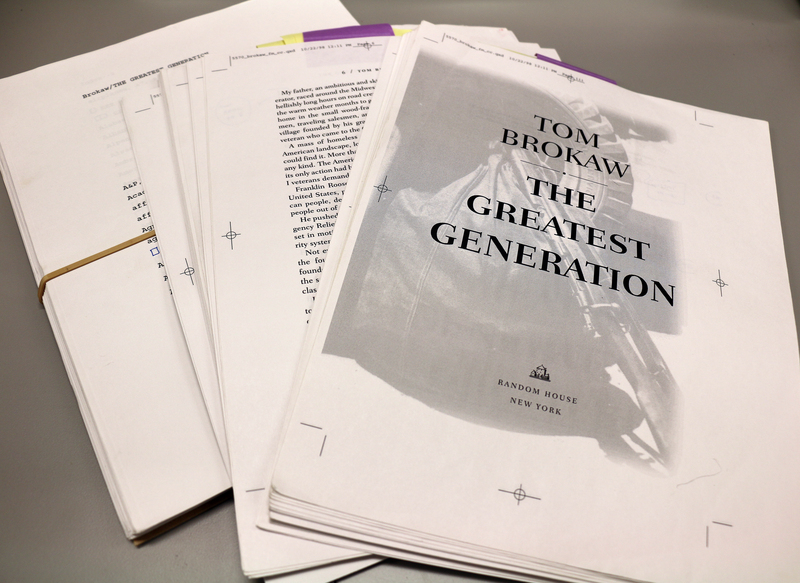 A galley proof of The Greatest Generation, as it appears in The Papers of Tom Brokaw. “When I return to Iowa City, I like to walk from Hillcrest across the river to the main campus because it is so evocative of that time long ago when Iowa represented for me an instructive experience in stepping into a larger, more competitive world,” he says. Though his time at UI was brief and somewhat tumultuous, he says it was a transformative experience.